When we were in China it took me less than 24 hours before I plunked headbands on Michal and Kenna's heads. And, miraculously, they left those headbands on for the entire day. That was the beginning of my love affair with headbands. And when it comes to headbands Dolce Vita Mia makes some of my very favorite ones. Dolce Vita Mia headbands include beautiful embellishments that remind me of the things you'd find in an old millinery shop. I bet they'll be some of your favorite headbands too! And Dolce Vita Mia is going to give one winner two beautiful headbands! I know the winner will have a hard time deciding what to choose . . . Please go visit their store and then come back and tell me what you liked. If you'd like an additional entry, you can visit their Facebook Fan Page and tell me that you became a fan. • Deadline to enter is December 13 at 12:00 midnight Central Time. • You may get another entry by sharing the fun. Just grab the button to the right and put it on your blog or Facebook page. Leave a second comment letting me know that you did. • You may get yet another entry by becoming a Dolce Vita Mia Facebook fan. • The winner will be posted on December 13. I go back and forth between the colorful ones and the neutral colored ones. I really like the aqua one. I like the Lola or the Millie. I think I would wear these. They aren't too baby-looking. Another win Kristi! 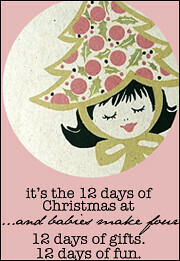 I also have your Christmas giveaway button! The light blue chiffon and the brown rosetta would look sweet on my nieces. The flower clips - love ! We love flower clip ons Since Maggie has to wear her hearing aid on a headband everyday. Your button's on my blog and I am a Facebook fan. They are all so beautiful, how could one ever decide and pick a favorite----sigh. I just love them all!!! love the kennedy black and the light blue lace, but i loved them all, my daughter is just starting to wear headbands, she has such a small head and thin hair so head bands seem to work better than barrettes. i think i became a fan??!! not sure how exactly to do that, what a loser I am!!!!! Alice in Wonderland headband is my favorite. Love the Alice and Wonderland and Pink Rosette. Love the three rosette band in peach. I really like the Alice in Wonderland Black Beige Flower Headband! Very elegant for our sweet girls. I'm assuming the bands are comfortable...some are/some aren't. Sounds like K and M think they are? Love the NORA Aqua Teal Turquoise. You are so right....it's so hard to choose just one! 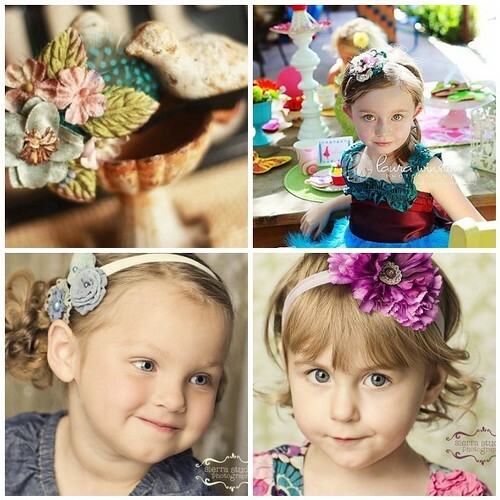 They are all gorgeous, but I really love the Alice in Wonderland fabric head band. Just beautiful and I love the colors. The Fiona and the Avey are my favs! I also have your button on my Ciao Bella Blog! I am a fan of Dolce Vita Mia on FB too! Oh, the light pink one is just adorable. I think it would look great on my 15 month old! Definitely the Matilda Jane Field Trip. My 4-year-old would love those feathers! This is so much fun! Thank you! Love the Fiona! Too cute. HOW UNIQUIE! Love the Alice in Wonderland. They are all my favorites! Wow! How could I ever pick? Wow. This one was HARD!! So many beautiful headbands. I am a sucker for a headband too. My daughter refuses bows most of the time but a flower headband is at the top her favorites. I am going to say the M2M Matilda Jane Fiona and the Kaila hot pink and purple. I liked Dole Vita Mia on FB!! WOW! How can you pick? I can't pick a favorite because I would sweep the store if I could afford it. Keira's little head would look so great in any of them! Love the tip and the give-away! OH! And I became a fan on Facebook too! I love them ALL, but the brown one/neutral one is so beautiful! I became a Facebook fan of their page, too! I love headbands! All of these are so beautiful! Love the clip on flowers-so cute! Oh, if I had to choose, I would say thie Millie....but I love them all! I like those flower clips! I love the pink head bands but also the clip. It would be really cute on a jean jacket or hair. I love the 3 pearl rosette in light blue and the Alice in Wonderland!!! And I posted about the giveaway on FB! OH, I just love the purple lavender flower! Beautiful headbands and such lovely photography on her site as well! I like the New Light Blue Lace one. Thanks for letting us know about their website! Oh wow, can I say them all LOL? I love all the colors, but love the neutral ones too, so I'll say the Jensen and the Amelie. I love the Mille in the lovely brown colors- it would match her Christmas dress perfectly! Love the Alice in Woderland or the three rosettes. Beautiful! LOVE the Matilda Jane field trip or the Millie beautiful brown! Seriously how do you have time to search and find all these wonderful things? I like the hot pink rose flower that can be used as a hair clip. What beautiful work! They are all amazing and all my favorite. I love all the colorful ones. They are so beautiful! Went to FB and became a fan!! And I became a FB fan! OOOH so hard to choose a favorite! love them all, but the red cabbage rose headband is my favorite. I really love the three rosettes, in the light blue and the apricot. They are so beautiful and different. They look like they have had so much time and love put into them! I like all of them....too hard to pick! My favorite is the Alice in Wonderland. Wow...so many to choose from. I love the Alice in Wonderland and the light blue and lace handbands. I love the brown floral handbands too. I love the New Light Blue Lace and Chiffon - too cute. I love how these aren't just for the little girls!! I love the Alice in Wonderland, and any of the headbands would be so precious on my granddaughters. A headband is my favorite hair accessory. Thank you! I became a Facebook fan of Dolce Vita Mia. I love the Lola Red Cabbage Rose Headband Rhinestone Center . . . love them all, actually! The hot pink clip on, would look amazing on my daughters long silky black hair. Thanks for the chance. I love the Fiona! Another great find! They arevall beautiful, but I am partial to the light blue kace and chiffon headband. I'm a facebook fan too! I like the light blue chiffon fabric & pearl headband. *swoon* I love everything! The prices are so reasonable, I think I may just have to pick something for my girl even if I don't win. But if I do, I'll let my daughter choose her favorite and we'll get two-so we'll match! I like new Light Blue Lace and Chiffon Fabric and Pearl three Rosette...and also I become facebook fan. All of them are simply stunning, but I like the Millie or the Romy the best. Thanks for this link. I couldn't wait to see if I won...We had to purchase one of these beauties today! There is no way to choose...I love them all! I don't think these are too little-girl for a 15 year old, do you? Raegan would love a simple one, like the neutral colored one! Love the headband with the purple/lavender flowers. You pick out beautiful things! The Light Blue Lace is stunning. Fancy enough for a dress but subtle for the everyday too! What handmade beauty!!! I LOVE it all! I LOVE the monroe and the chloe and everything else! I'm a HAPPY Dolce Vita Mia Facebook fan! love the M2M matilda jane field trip as a clip.... headbands pop right off zoey's head! became a facebook fan, too! I love the Light Blue Lace and Chiffon Fabric and Pearl three Rosette headband! I love the giant peony with the rhinestone center...but they are all lovely....every single one. I love the sophia and the alice and wonderland, they are all just too precious!!!! LOVE the vintage look of all of the flowers. Very romantic and dreamy! We are huge fans! I love the pink peony with the sparkling center! (And all the others) My girl loves hair accessories! Would be happy to win any of these!!! So pretty. How can I pick just one of these? Ok, if I have to choose... The Fiona. I don't know how you find these things Kristi, but I wish you could be my personal shopper! The Avey is gorgeous! Of course, the MJane with the feathers is sweet too. Love these! Love the Matilda Jane Field Trip one. Oh, they are all so sweet. I think if I had to choose, it would have to be the Poppy Duo! New Light Blue Lace and Chiffon Fabric and Pearl three Rosette Headband was darling!!! !